Violations of the licensing requirements regarding firearms are taken very seriously in the state of Masachusetts, often requiring mandatory minimum sentences upon conviction. In Massachusetts, a Firearms Identification Card allows an individual to possess rifles and shotguns but possess firearms only in their home or place of business. An FID card does not allow the individual to carry a firearm on their person or in their vehicle. To legally carry a firearm on one’s person, a License to Carry(LTC) must be obtained. In Massachusetts, a firearm is defined as a pistol, revolver or another weapon, one that is unloaded or loaded, from which a bullet or shot can be discharged. The length of the barrel must also be shorter than 16 inches in order to qualify as a firearm. For any such charge, it is recommended that you work with an experienced attorney. Michael M. Monopoli and Mark Monopoli are experienced criminal defense attorneys who will fight for you. For more than forty years, the Law Office of Michael M. Monopoli has defended individuals charged with firearm offenses in the state of Massachusetts. Carrying a firearm(269/10(a)) without a proper license is a felony punishable by a mandatory minimum 18-month house of correction sentence up to two and one half years. If an individual is indicted on such a violation and is in superior court, a two and one-half year mandatory minimum state prison sentence, up to 5 years is possible. Carrying a firearms means having it on one’s person outside of their home or workplace or possessing it in one’s vehicle. Possession of a large-capacity weapon(269/10(m)) without being duly licensed is punishable by a mandatory minimum two and one half years in state prison up to ten. Possession of a machine gun or sawed-off shotgun is punishable for any term of years up to life. 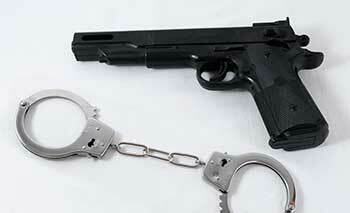 Possessing unsecured firearms is also a very serious violation in Massachusetts. Under Massachusetts General Laws Ch. 140, section 131L, an individual who fails to store a firearm, rifle or shotgun in a locked container or with a tamper-resistant mechanical lock shall be punished by a fine of $1000 to $7,500 or imprisonment up to 18 months or both. If said firearm was kept in a place that a person under 18 had access to it, the punishment is a fine between $2,500 and $15,000 or by imprisonment not less than eighteen months up to 12 years or both. If a large capacity weapon or machine gun is improperly stored, an individual may be punished by a fine of $2,000 up to $15,00 or imprisonment for not less than eighteen months up to 12 years. If a large capacity weapon or machine gun is improperly stored where a person under age 18 had access to it, it is punishable by a fine of $10,000 to $20,000 or by imprisonment for not less than 4 years up to 15.